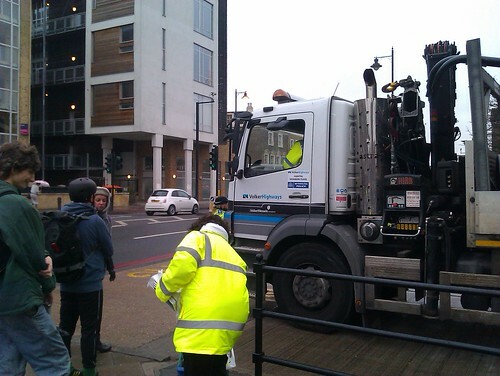 It is fairly common for London cyclists to jump the red lights, and some activists are even advocating that as a safer way of getting across the junctions. I don't think that's right and usually wait behind the vehicles instead of trying to make it to an ASL and beyond... however, when I'm sure that the road is clear, I don't bother waiting. I didn't stop on the fading amber lights today on my way to work and as it usually happens when you think no one is paying attention, I was stopped by police. To my surprise instead of being given a fine (which is £30, by the way) I was asked if I had 15 minutes to spare for a training on cycling safety. Certainly I agreed (and got a revenge as the policewoman showing me the way crossed the same empty road on red lights as well). I've heard before about that campaign started after the Bow roundabout collisions and protests organised by cycling community, but never seen it in North London. 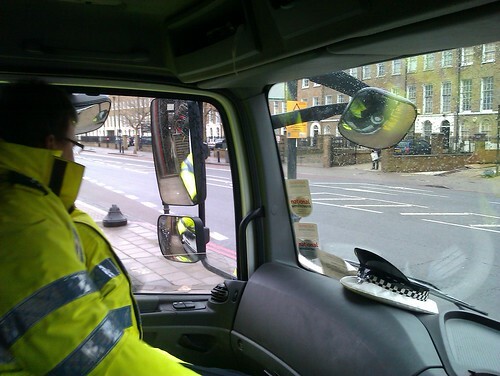 Basically, on this training you're asked to get into the driver's seat of an HGV to see how (in)visible are you for them (officers in hi viz and ordinary clothes walk around the cabin to provide an example). 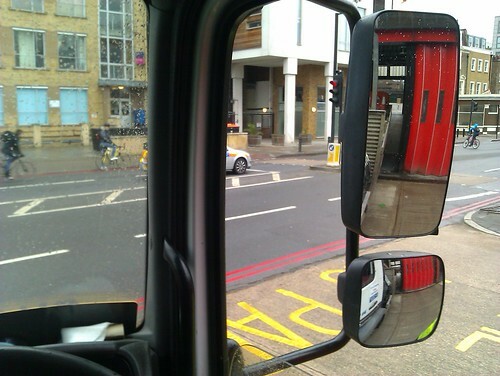 The problem is these mirrors are only mandatory since 2007, and owners of the lorries registered earlier are not required to fit them. The other problem is that they provide a very distorted image and dark clothes are really hard to see in them - that's something I can now confirm. That where the hated hi viz vests thanks to which you can instantly recognise a Londoner on a random cycling photo come useful as the yellow spot has way more chances to catch driver's eye. I tried to make a point that still it only makes sense if driver actually bothers to look in many mirrors they've got, and the necessity to be equipped and dressed properly puts many people off cycling at all, but I was still hurrying to the office and other people were waiting as well, so I didn't start a long argument. 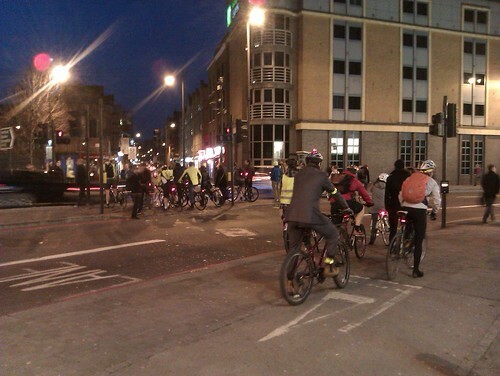 I work in Shoreditch now where cycling is very popular - the photo below shows what a typical crossing look like when people go to work or return home - so there is nothing wrong with Hackney council running campaigns like this. Also it definitely has something to do with the upcoming mayoral elections and Boris Johnson trying to reclaim his "cycling enthusiast" reputation, but whatever the reason is, it's a good thing. So if anyone have never driven an HGV before and is curious, don't hesitate to stop if you see a group of policemen near a lorry and ask for a training. That's an interesting insight.